Fresh air, cozy fires, marshmallows and hot dogs, hiking through the woods, a chance to unplug—there’s nothing like camping and I’ve discovered, over the years, when you have kids, it is one of the most rewarding mini-breaks you can have. Of course, it can also be chaotic madness. Just in time for Memorial Day, I’ve come up with my personal top five tips for camping with your kids—no matter how young. Joseph first camped when he was four months old. 1. Location, location, location. 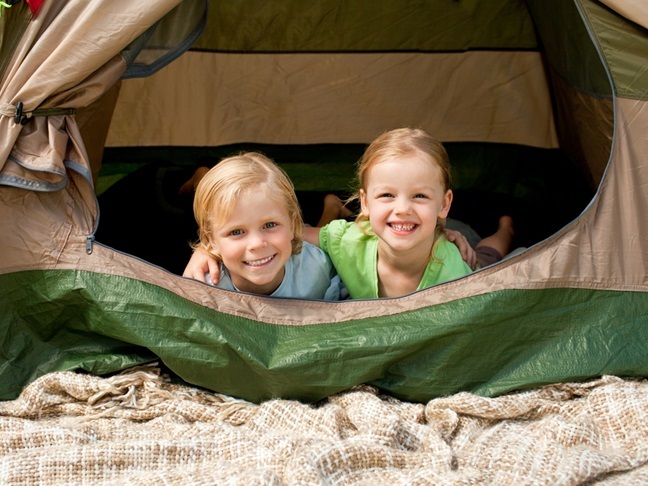 Keep in mind wide grassy areas, beaches, and small creeks—all of which turn a campground into a paradise for children. 2. Activities. While you may be content sitting in a hammock and whiling the hours away with a cold drink and a gossipy magazine, odds are your kids won’t be. A lot of campgrounds have pools, Junior Ranger programs, and even night time movies. One of our favorite campgrounds has natural rock slides which spill into sun warmed pools of water of various depths, the most shallow only a couple feet deep and perfect for little ones. 3. Food. Bring lots of it. I like to do crazy things like make lasagnas in Dutch ovens over the open fire, but I also always pack simple camp foods like hot dogs, mac ‘n cheese, plenty of fruit, and waters. And don’t forget s’mores fixings. 4. Cozy bedding. I’m guilty of “glamping”, but I’ve found, over the years, there’s nothing like fresh sheets, down comforters, and a down mattress cover over a double high air matress to make sure the kids and I wake up each morning refreshed and ready to take on the day.